Summer is now coming to a close (finally) and fall is right around the corner. Fall not only brings beautiful burnt orange leaves, trick or treating, turkey and football, but it also brings cooler temperatures. Before you know it, the heat will be kicking on regularly and hot chocolate by the fire will be a common occurrence. Now is the time to start preparing your HVAC system for the coming fall and winter season. Here are some tips that can get you started in the right direction. Businesses and homeowners should be changing their air filters regularly. Dirty furnace and air conditioning filters can cause many problems with your HVAC system. For example, a dirty filter can prevent your home from being heated or cooled efficiently, causing your electric or gas bill to be unnecessarily high. Replace your furnace filter before the cooler temperatures arrive so that your system is prepared for fall and winter. Before winter arrives, its always wise to check for air leaks around windows and doors. Investing in door draft blockers and caulking windows will help prevent leaks. In some cases, replacing the weather stripping around doors might be necessary. When you seal your home against the cold outdoor air, your furnace doesn’t have to work as hard to heat your home. 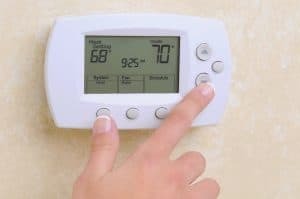 Setting your thermostat to heat and to the proper indoor temperature will ensure an easy transition into the cooler months. Programming your thermostat to lower temperatures at night will help keep the heating bill lower and will ease the strain on your HVAC system. We recommend setting the thermostat to 67-69 degrees during the day and 57-59 degrees at night. Make sure that your vents are clear from any debris and that there are not any large objects like boxes or furniture blocking airflow. The key to having an efficient and long lasting system is having good airflow. HVAC maintenance can sometimes be an intimidating task. To have peace of mind that your HVAC system will be in tip-top shape this fall and winter, contact us to schedule an inspection. If you have a system that includes an outdoor unit, do a visual inspection for any damage, especially to hoses and cables. Any leaks or frayed wires can be potentially hazardous, so its best to leave those repairs to the professionals. Remove any debris such as leaves or dirt from around the unit to ensure that it has the proper airflow.